It has taken just one round to realise that reigning QAFL premiers Palm Beach Currumbin are again going to be major players in the race for the 2019 flag. 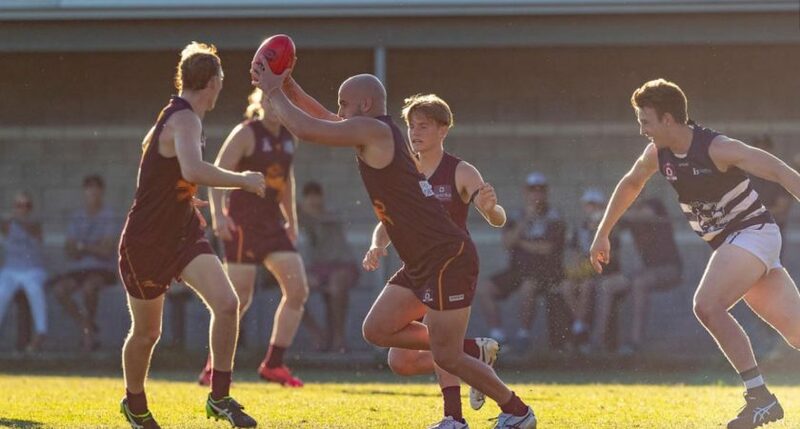 Chasing a hat-trick of titles but with a new coach Jess Sinclair in control, the Lions opened a new campaign with a crushing win over 2018 grand final rivals Broadbeach at Salk Oval. The premiers won by 15.15 (105) to 6.12 (48) for a clear-cut 57-point victory in the Gold Coast derby. Obviously, there is a long way to go before the final square-off at season’s end, but the Lions looked to be every bit as good as their predecessors from 2017 and 2018. And, quite ominously, their major offensive weapon, full-forward Jack Anthony, started the new season off just like he ended 2018. Anthony was Joe Grant Medallist in the 2018 grand final and against the same team in Broadbeach he opened 2019 with a haul of 8.1 (plus two out of bounds) and was named man-of-the-match again. Sinclair knows he has an attacking bonus in former Collingwood and Fremantle AFL player Anthony and just hopes things go along nicely for the remainder of the season. “Jack looked a threat every time the ball went in one on one,” Sinclair said. “He had a turf toe problem in the off-season but he is a true professional and does a lot of work outside the club. As strange as it may sound, Broadbeach’s selection at full-back, big Xavier McMahon, was arguably his team’s best. He may have had eight kicked on him but ‘X’, as he is known, broke even with Anthony overall and often led the PBC gun to balls kicked in short to the 50m zone. PBC’s strength for a few years has been their pace and it was clear that department is again well covered this time around. But as Broadbeach coach Beau Zorko, in his first start at the club, the Lions had too much cohesion and had a dominant defence. “We showed signs of a group that had not played a lot together,” Zorko said. “Look at Palm Beach’s back six, they’re all premiership players and they were cleaner, more familiar with one another and they were well organised. The Cats have a number of players, some with leg speed, to come back to the fold and that will help the side as the season wears on. Apart from a third term when the Cats looked like getting back into the match, the Lions held the advantage after leading by 19 points at quarter-time and by 30 at the big break. Teenager Ethan Hunt, only 16 and fresh from the Gold Coast Suns Academjy, kicked three goals in a lively seniors debut. Former skipper Jesse Derrick, defenders Liam McNeven and Jackson Emblem, who kept ex-Collingwood forward Jason Cloke to two goals, and ruckman Jon Croad were outstanding for PBC. McMahon, half-back Darcy Irwin and midfielders Jackson Fisher and Nick Burton worked hard for the Cats. GOALS, Palm Beach Currumbin: J. Anthony 8, E. Hunt 3, N. Crowley 2, L. McNeven 1, J. Croad 1. Broadbeach: J. Cloke 2, M. Fowler 1, B. Hancock 1, R. Dienjes 1, J. Fisher 1. BEST, Palm Beach Currumbin: J. Emblem, L. McNeven, J. Derrick, J. Anthony, J. Croad, C. Marsden. Broadbeach: D. Irwin, J. Fisher, N. Burton, T. Betson, J. Newman, X. McMahon. Stocky Mt Gravatt forward Sam Stubbs is fast earning a reputation as ‘a closer’, a player capable of sealing the deal to win pressure matches. Just as her did last year when, in a Round 17 clash against Surfers Paradise Stubbs kicked a winning goal after the siren, the key attacker was at it again as Mt Gravatt edged cross-Brisbane rivals Western Magpies, in a tense battle at Dittmer Park. Stubbs soccered the ball off the ground close to the posts for a goal that put the Vultures a goal up at the 26th minute mark of the fourth quarter. The home side held on for another scoreless seven minutes to claim victory by 13.10 (88) to 12.10 (82), a result that heralded new coach Adam Boon’s entry into the senior coaching ranks. As the final scoreline suggests, it was even-stevens the whole way through. Boon described the clash as scrappy, but that was purely because of the physicality. “It was physical but that is what we expected and that’s the way it panned out,” Boon said. Former Redland stalwart Boon missed the game because of knee soreness but he expects to be right for next weekend’s big game against Broadbeach at Subaru Oval on the Gold Coast. Mt Gravatt has plenty of good players, none better than half-back Mick Hamill and midfielder-forward Jasper Craven, who is on Aspley’s NEAFL list and is on the comeback from a shoulder reconstruction. Another standout for the Vultures was Frazer Neate, who took some heavy punishment from the Magpies but managed to end the game on a high. Over in the Western Magpies camp the disappointment of losing in the opening round was evident, although coach Brydan Morgan took plenty of positives from the clash as he awaits the return of skipper, ex-Brisbane Lion Ryan Harwood. A winner for the Magpies was ruckman Liam Dwyer, who is on the Redland NEAFL list. Dwyer rucked all match against Mt Gravatt’s highly-touted big man Andrew Smith (Redland) and did himself proud. Will Fletcher and Riley Easton on the ball and young full-forward Jack Austin was impressive up front. “It was evenly contested, and the result could have gone either way,” said Morgan, expressing disappointment at some skill errors. “We didn’t get our midfield-forward connection right and I was a bit disappointed at our skills execution by missing targets up front. “There were misses from where there should not have been misses. Morgan said it was definitely not an endeavour thing and that the Magpies need to add a bit of polish to be right in the flag fight. GOALS, Mt Gravatt: S. Stubbs 5, D. Nash 3, H. Hunkin 2, J. Craven 1, K. Walsh 1, Z. Stone 1. Western Magpies: J. Goodall 3, J. Austin 2, B. Lumber 2, M. Lonergan 1, W. Fletcher 1, K. Reed 1, T. Baulch 1, W. Johnson 1. BEST, Mt Gravatt: M. Hamill, J. Craven, F. Neate, S. Stubbs, D. Nash, T. Carbone. Western Magpies: L. Dwyer, W. Fletcher, R. Easton, J. Austin, D. Lawrence. Morningside can thank a period late in the second quarter that helped them to an opening-round win away to Labrador on Saturday. Handing Clint Watts success in his first start as a seniors coach, Morningside prevailed in a tight contest6 by 11.8 (74) to 9.8 (62) at Cooke-Murphy Oval. There was little between the two sides throughout, Watts agreed, but that period just before half-time proved vital in the final analysis. Labrador led by 11 points 14 minutes into the second term. But when the Panthers put on three unanswered goals they were a goal up at half-time. “Probably that lapse came back to hurt us,” Labrador’s skipper Bryce Retzlaff said. Away from that slip-up, the Tigers matched it well with fellow rebuilders Morningside. Watts said the rivals played a similar style of football in what he described as a ‘really good game of football’. As ex-Aspley midfielder Henry Joyce opened life as a Panther with a best-on-ground effort, Watts was impressed by 17-year-old Nathan Colenso’s debut performance which was highlighted by three goals. Nathan is the son of former Coorparoo top-liner Andy Colenso and did not look out of place at QAFL level, according to Watts. Daniel Frame at half-back and on-baller Lachlan Russ were others to serve the Panther cause well. The win was just what the doctor ordered for the Panthers because they had focussed on the importance of winning away heading into two more matches against Gold Coast clubs. Retzlaff, who kicked four goals from centre half-forward, said there was plenty of promise for what is a club very much into rebuilding mode. “We take positives out of this,” he said. Retzlaff said the club had a focus on a couple of key areas during their off-season recruiting and that the weekend’s performance was ‘a step in the right direction’. Labrador’s best were Retzlaff, Dane Watmuff, quality centreman Alex McKay, recruited from Tea Tree Gully in Adelaide, and youngster Anthony Djurovitch. GOALS, Morningside: N. Colenso 3, W. Pendlebury 2, A. Mitchell 1, L. Rogerson 1, D. Cameron-Reeves 1, E. Mallan 1, R. Dadds 1, A. Robertson 1. Labrador: B. Retzlaff 4, J. Boxer 2, J. Young 1, H. Barry 1, S. Walker 1. BEST, Morningside: H. Joyce, D. Frame, L. Russ, D. Cameron-Reeves, P. Mollison, N. Colenso. Labrador: B. Retzlaff, D. Watmuff, A. McKay, A. Djurovitch, J. Young, M. Lakeman. Surfers Paradise survived a pressure test from Wilston Grange to open their 2019 campaign with a 40-point win at Sir Bruce Small Park on Saturday. Grange, a side that will get stronger and stronger as more regular seniors return to the fold, made the Demons work hard for their victory and the final scoreline belied the effort put in by the visitors. “To their credit Wilston Grange made it a tough encounter and they went one-on-one in defence,” Surfers coach Brad Moore said. “They were able to shut us down a bit but in the end we managed to work through the congestion. “But it was not a pretty game, it was a real slog, so credit to them (the Grange). Southport NEAFL-listed Sam Jewell, a Demons product, put his hand up for a call-up to the higher division with an outstanding performance across the half-back line. He had strong support in defence from Mitch Comben, a player who may finally have shed the injury run that had shackled his career after he was named Rising Star Award nomination in the opening round of 2016. Another player hoping for more luck with injuries is Connor McKenzie. He impressed with his work in the middle and when used in attack. Big Matt Green was also conspicuous in his roles in the ruck and up forward. Tom Smart, a recruit from Coorparoo, was named best for the Grange, who basically lost the game in the first quarter when they trailed by 26 points. Others to go well for the Grange were Jack Tomkinson, recruited from the Sunshine Coast, regular visitor to the best lists Frazer Eaton and Angus O’Brien, a product of the Aspley juniors. The Grange have a fortnight to get over the disappointment of losing first-up because they have the bye next weekend when Surfers travel up the M1 to engage Morningside at Jack Esplen Oval. GOALS, Surfers Paradise: M. Green 2, D. Van De Werken 2, C. Filewood 2, T. Smith 1, P. Rankin 1, N. Corbett 1, M. Doran 1, C. McKenzie 1, D. Green 1. Wilston Grange: F. Eaton 3, J. Tomkinson 2, D. Reid 1, J. Farry 1. BEST, Surfers Paradise: S. Jewell, M. Comben, C. McKenzie, N. Scott, M. Green, N. Trevena. Wilston Grange: T. Smart, J. Tomkinson, F. Eaton, A. O’Brien, J. Coulter, I. Corvo.